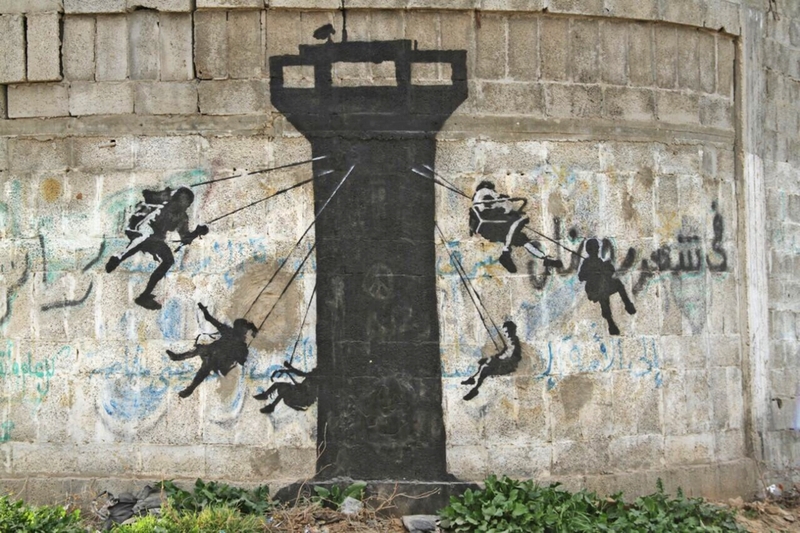 Whenever a new piece by graffiti artist Banksy shows up in the world, people take notice. 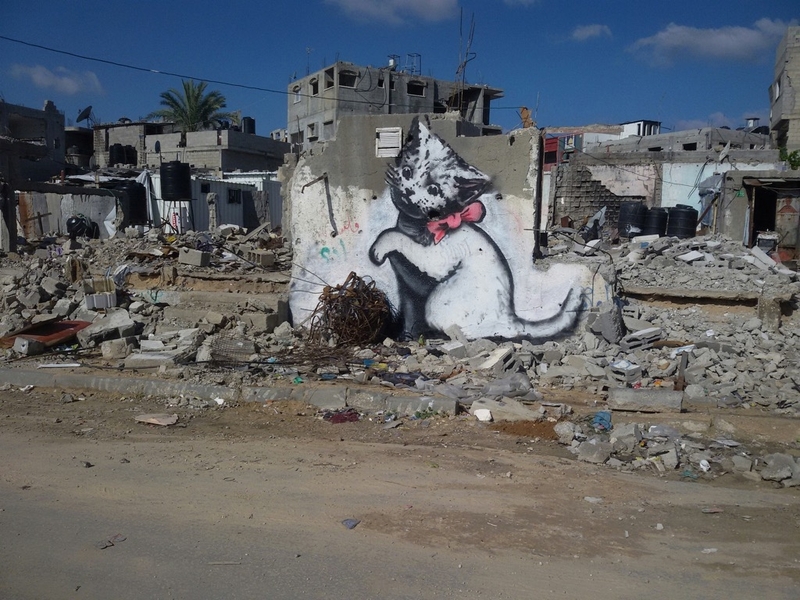 Now, thanks to Banksy, the world is once again looking squarely at Gaza after what feels like the first time since the Gaza war last summer. Israel's 50-day military operation against Hamas killed more than 2,000 Palestinians, most of them civilians, and turned much of Gaza City into rubble during the conflict. 72 Israelis also died, including 67 soldiers. You'd think that kind of devastation would be hard to forget. Apparently not. Back in October, world leaders and staff met up at a conference in Cairo that was organized to raise money for rebuilding Gaza. Together, they pledged $5.4 billion. But as of mid-February, only $300 million has been delivered, according to Al Jazeera. Seems like the world needs a reminder. 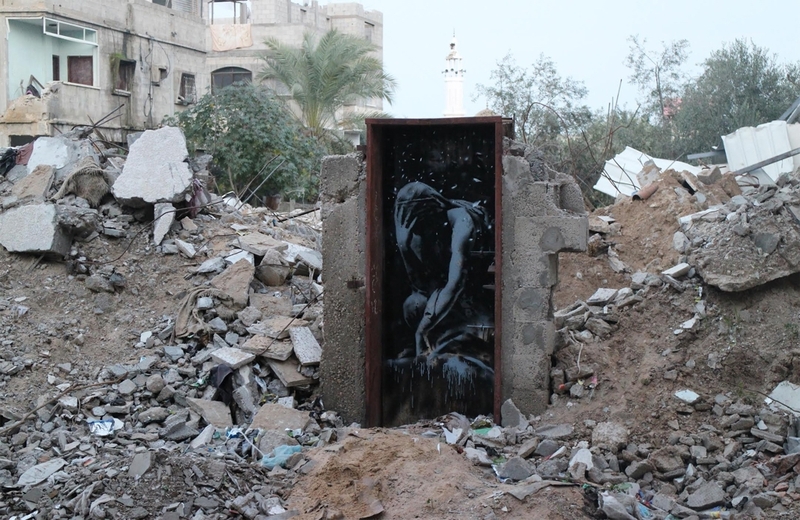 On Thursday, the anonymous street artist and activist posted a series of photographs and a video on his official website that show new works of art in what he claims is — and seems to be — Gaza. There's this crying and contorted figure that's reminiscent of a classical sculpture. And there's this carnival swing ride attached to a surveillance tower. 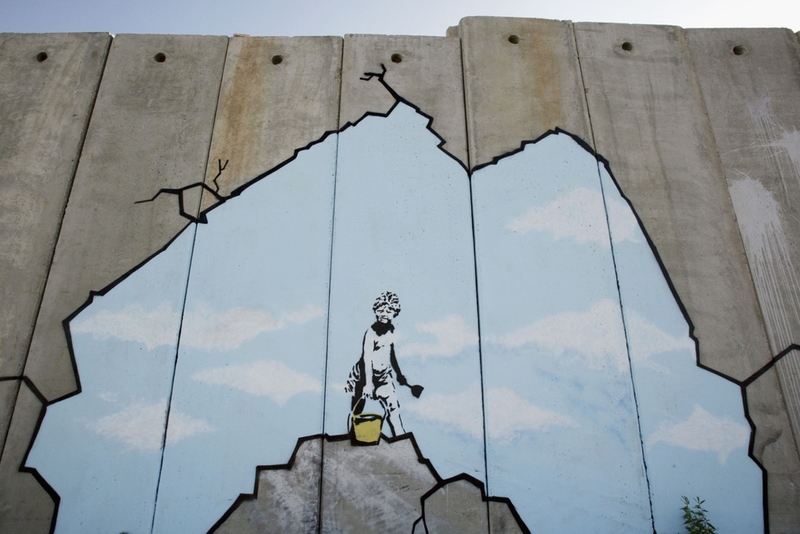 Banksy isn't shy about his politics with respect to Gaza. Some of the photos on his website include captions. "Gaza is often described as 'the world's largest open air prison' because no-one is allowed to enter or leave," reads the caption for the guard tower swing. "But that seems a bit unfair to prisons — they don’t have their electricity and drinking water cut off randomly almost every day." His caption for a photo of the cat: "A local man came up and said 'Please — what does this mean?' I explained I wanted to highlight the destruction in Gaza by posting photos on my website — but on the internet people only look at pictures of kittens." There's more where that came from in a two-minute satirical video accompanying the photos. The video, which is titled "Make this the year YOU discover a new destination," gives the impressions that Banksy shot it himself and offers the viewer a brief glimpse into life in an unidentified part of Gaza. It presents itself as a travel advertisement, using tourist-y cliches to encourage people to visit and undercutting those same cliches with devastating parenthetical statements. That text accompanies footage of a destroyed Gaza and its people. The effect is jarring. Make this the year YOU discover a new destination. Welcome to Gaza. Well away from the tourist track. (Access is via a network of illegal tunnels.) The locals like it so much they never leave. (Because they're not allowed to.) Nestled in an exclusive setting. (Surrounded by a wall on three sides and a line of gun boats on the other.) Watched over by friendly neighbors. (In 2014 Operation Protective Edge destroyed 18,000 homes.) Development opportunities are everywhere. 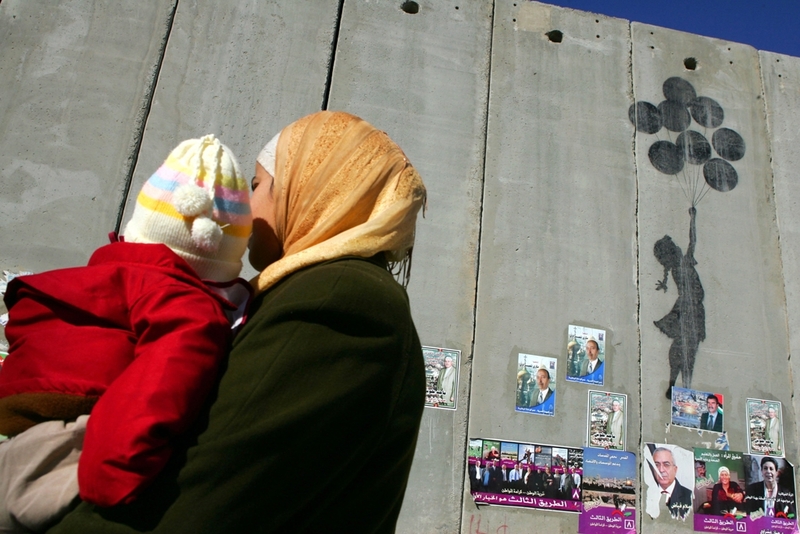 (No cement has been allowed into Gaza since the bombing.) Plenty of scope for refurbishment. The video ends with a photo of a wall with the following words written in red: "If we wash our hands of the conflict between the powerful and the powerless we side with the powerful — we don't remain neutral." 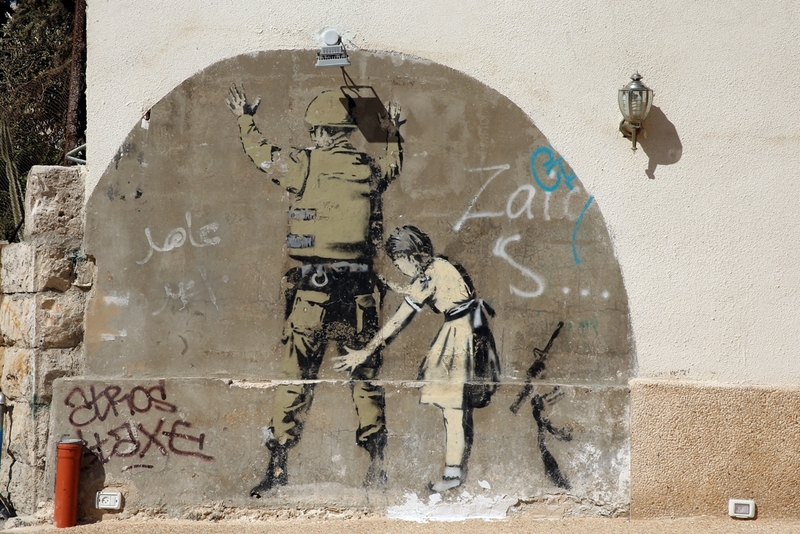 It's not Banksy's first time in Palestine. He visited the West Bank in 2005. There, he produced some of his most iconic pieces to date, several of them painted directly on the barrier wall separating the West Bank from Israel. Like his child with a beach bucket. This girl carried off by balloons. Quite a body of work Banksy's putting together there.